Do a TEFL course or not bother? I’ve seen this argument come up a few times in various places over the last few weeks, mostly in the Facebook teaching groups I joined when I was promoting the pre-conference survey Russ and I did. And then, there it was again on ELTjam. A lot of ELT people feel really strongly that anyone doing an online teaching course with no practical component is insulting the industry and every professional in it. Not to mention doing the students a huge disservice. I have the Trinity TESOL and an MA in ELT – self funded. Whenever anyone asks me what course I recommend they do, I always ask them where they want to go and teach. And, maybe, how long they plan to stay in teaching. (My personal advice being make sure you have a get-out after two years because you can only grow old, poor and pensionless in ELT). The truth is, much as no-one wants to admit it, that having that first qualification didn’t make me a professional teacher. Experience did. And I don’t mean the “experience” I got doing 7 whole hours of observed teaching practice. The argument that you wouldn’t want to go to a doctor who has no formal training, so why a teacher, falls apart as soon as you hold that against the wealth of practical teaching experience I had when I was inflicted on my first class. I was a crap teacher for my first year. My very first job was at summer school in the UK — teaching teens whose parents had paid hundreds of pounds for them to be there. I was hired by a British Council accredited school fresh of my TEFL course with no interview, not even by phone. My course had taught me nothing about dealing with teens and I winged it the entire month. It was loads of fun and I returned five times. At least later on I was able to support the other newbies that came after me. There wasn’t much in the way of support for them otherwise. I also didn’t concern myself too much if I was late to class, sometimes I didn’t even turn up. I kind of planned – that is one thing the TEFL course really does do for you: teaches the art of detailed lesson planning which you only ever then actually do if you have an observed lesson — and once I had to leave class because I was so hungover I threw up. It was a 4pm class. Even when I was making an effort, for a student I really liked, I was crap. I once had a one-to-one business student for a 2 week intensive before he was due to go on an important work trip abroad. Needless to say, my £770 TEFL course had taught me nothing about Business English and I had no personal experience of the world of Real Jobs. I noticed he had a problem with definite articles so did a lesson on that. Because that was so what he needed, right? And, being the trained professional I was, I recognised that. The TEFL course teaches you some very important things. That you don’t know English grammar, you just speak it, and you must learn it in order to teach. And about eliciting, concept checking and maximising student talking time. That’s about it. Experience teaches you the rest. There are no courses that can give you more than a taster of that. Thinking on your feet, responding to different personalities in the classroom, dealing with teenage apathy and Young Learners running rings round you. You get none of that on any course, face-to-face or otherwise. 1. Never tell students you only did a four week course. They might not understand just how thorough that training is and wonder why they’re paying so much for you to be there. 2. Never admit how long you’ve been teaching if it’s only a few weeks/months. They might not understand just how thorough your recent training was and wonder why they’re paying so much for you to be there. Why the secrecy? Could it be because within ELT everyone knows students won’t like it, won’t put up with it, Lord forbid, won’t pay for it? Where I started being a better teacher, an actual professional instead of just one with a paid-for professional qualification (Does anyone actually fail the TEFL courses, by the way?) was in my second year abroad in Thailand. It was a much more professional school although it had no input sessions or anything resembling it. Half my timetable was Young Learners, again, something for which I had no training whatsoever. I observed other teachers, we shared ideas and I ended up pretty good at it. Not only that, teaching Young Learners made me a much better adult teacher too. As did just simply having gained more hours on the clock. So by the time I was placed in front of FCE students with an exam 3 months away, although I’d never had any training in teaching exams, I did OK enough but mostly learned how to teach FCE for the next time students were depending on me and my expertise. I’ve actually seen people comment that teaching is mixture of Art, Science, skill, experience, psychology and many other things and then berate unqualified teachers for not having what can only ever be a small part of the mix. The other thing that makes no sense to me about this entire topic is that, once again, the onus is on the teacher to be the professional one. If there are schools that hire unqualified teachers, there will always be people that would rather try out the job for a while, maybe qualify later, maybe not, than pay the high fees for a one month intensive TEFL course. Just like with other problems in ELT, not anywhere near enough pressure is applied to language schools which are the worst thing about the industry. People who are earning nicely at the top of the food chain i.e. a handful of people with books on the CELTA/DELTA list and the big chains – do you run TEFL courses for free? Or offer people who can only afford an online course to come and shadow, or co-teach, your classes — an invaluable way of learning to teach? What’s more, this is not something that only happens to students in other countries where the rules about qualifications are lax. It happens to EVERY SINGLE language student who is paying the same price for a newly qualified teacher as they do for someone like me with years of teaching and two shiny qualifications. Why are schools, even the major ones, not being railed against for passing off that sleight of hand? Mainstream UK schools quite clearly hire NQTs and pay them less than they will if they make it through that year. And they get all that silly pension, pay-rise, ongoing training opportunities, holiday pay, promotion, adequate salary stuff that ELT teachers never will. Good luck saving up for that on your TEFL salary, new teachers! It now costs about double what I paid for mine. Maybe your school will pay you through it … Ah wait, nope, that’s YOUR responsibility, not theirs. They’re only the ones banking the enrollment fees, not the ones who should ensure teaching excellence. **Who else gets treated like this? Students in elite fee paying schools in the UK. Private schools in the UK are not subject to the same hiring rules as state schools and can recruit people just because they excelled academically and went to the right kind of university. Those students then go on to have a higher chance of getting into an Oxbridge university themselves so something other than training has to be a factor. *** It often seems to me that people just get angry that they paid for the course while others are getting jobs without having made the same cash up front investment. Oof. You’ve just made me realise how lucky I was on my Trinity course (which was subsidised through EF, who I then went on to teach with). My course was fantastic. I still remember three of the tutors on it who were some of the best and most inspiring teachers I’ve ever encountered (Grev, Huan and Geoff – where are you now?). Of course I wasn’t an amazing teacher the minute I qualified, but I felt very prepared, and had lots of training in particular on thinking on my feet and responding to the different personalities in the room. I was able to use this to adapt to business English teaching and teaching kids when I started in my school (in fact, our course did include some training specific to teaching young people). I agree with you about the lack of professionalism in the industry and what a shame it is (and what a bad deal many students get as a result). I do think its a two way thing though. Teachers need to be professional as well, if they want to be treated as such. Thanks for your comment and glad to hear your course was so good. Actually, my course WAS very good. But the best of the best only puts you in front of students for a handful of hours and, as you say, can’t produce “amazing teachers” off the starting blocks. The only student who got an A pass was one who had taught for a year in Japan. Which is what I mean – the course only goes so far. Great article! With so many different TEFL/TESOL courses out there, it also takes careful research at quality courses, affordability (in both time and money). I have a TESOL certification from the American TESOL Institute. Courses like the CELTA and DELTA are great but not always affordable. I’ve also been teaching for five years so far and experience is much more valuable than a piece of paper. I teach fourth grade at an international school in South Korea. It’s a small school but I’m happy. I taught at a private kindergarten last year and it is great to be at school where I feel like I’m doing something worthwhile. About people failing TEFL courses; some do. I have friends who are CELTA trainers and they fail people that don’t make the grade or who are clearly not fit for an EFL classroom, based on the criteria of the course itself (although I’m sure the extent to which this happens varies greatly from one school/institution to the next). On the very first day of my own TEFL course in London back in… oh, a long time ago now (1995), my fourteen cohorts and I were told in no uncertain terms, “EFL is not for everyone, and not all of you will pass this course,” and sure enough, three of the fifteen failed. But you’re right about a general lack of professionalism in the industry as a whole. That’s interesting to know as it was a genuine question. I wonder if that is still the case or if the market takes a more tolerant view towards its paying customers and gives them the qualification after making them resubmit work etc? And about the value of experience over course input, as well, I meant to add! Thanks for writing this! I’m so glad you added your voice and perspective to the discussion. It was needed very much. I myself don’t know why it’s so important that TEFL teachers be put on the same level of prestige as doctors and lawyers, and I am also skeptical that higher barriers to entry would really accomplish that. Just as you say, teaching is a craft that is honed through experience, dedication, reflection, and by throwing yourself into it — just like many other noble and important professions like writing, art, ballet, politics, sales, jazz music, computer programming, editing, filmmaking, and so many others. I am proud to have a career like that and our colleagues in ELT should be proud too. Thanks Mike! I think almost any profession I can think of has various ways into it, whether by extensive qualifications or on the job training or the enthusiastic self-trained amateur, or combination of all three in various orders. You’ll be better or worse at the job depending on ability and experience probably. I think, but could be wrong, that when teachers say they should be on the same prestige level as doctors and lawyers what they mean is their job is equally valuable because with no education, how can anyone become a doctor or lawyer? And that they approach their job with the same seriousness and sense of professionalism. I don’t think they can mean they train as long, nor take as rigorous exams, nor deal with the equivalent implications of life or death, liberty or jail because that simply isn’t true. It was interesting to me to read that your experience teaching young learners in Thailand and observing/exchanging lessons with other teachers helped you become a better teacher. I didn’t have any formal training before I began teaching, but I did have a group of teachers who were willing to share their work and reflect about lessons together. Whether they realized it or not, their support and professionalism probably did more for me than a short 4-week course would have. Having said that, I wish I had had a chance to get trained and learn more about language because sometimes I remember some of things I did in class and wow… not too proud of it. I relied heavily on my textbook, and even though now I don’t like doing that, I will always see the value on those teacher guides when you are new to teaching. Anyway, I agree with you that trained teachers don’t get the financial benefits they should. It’s a truism, alright, but I’m convinced we’re in a profession that doesn’t reward our work as much as it should -regardless of where we go. I’ve taught at fancy private universities where coworkers with PhDs (teaching writing in an English-medium uni) were still not able to get the job title professors in other departments got. Sad realities in our profession when it comes to remuneration, that’s for sure. Ha! Well I have the same embarrassment and I WAS trained! In a previous post, I mentioned that my TESOL certification is not worth the paper it’s printed on, and that in class experience has been infinitely more valuable in teaching me how to be a teacher. But would I tell anyone to ‘not bother’ with a TEFL course (or an equivalent)? “Not worth the paper it’s printed on” is pretty damning all the same! I’m not sure I would say that about mine! Your description of your first post-course teaching experiences echoed mine; I’d say in both cases we were products of a poor environment doing the best we could with no support. Sadly, I’d imagine this is the norm for many new teachers, so I hope anyone thinking of starting out reads this and gets a feel for what it will probably be like for them. The summer school had poor support but my first year in Prague had a fair amount (for TEFL) but you’re right, most teachers can expect little! Really interesting! I’m big on making it abundantly clear whenever (if ever) anyone wants me to teach them that I am by no means qualified etc., but of course in a way having no qualifications doesn’t mean you can’t teach. I don’t have any qualifications on the French horn but I’m doing a masters and I’m fairly confident I could teach someone. However, that (and teaching English/French) would probably only be up to a certain point…I think that after said point, which remains undefined so far, qualifications and the experience you get from them would help hugely. Also, I would absolutely not want to spend an hour teaching a class – and even if I were confident about doing that I’d feel under immense pressure to be worth the money I was being paid, and I almost certainly wouldn’t feel I’d be worth it (in terms of education). How long are the classes you teach then? Just out of curiosity! Between an hour and two hours…usually about 90 minutes or so. So exactly halfway between an hour and two hours! This is no doubt a late reply, but I’m curious. I’ve just been denied access to a CELTA course due to getting one answer incorrect. Before this, I had attended an interview, written two short but well presented essays and had passed two small tests. Perfectly, not a problem. Unfortunately, the last step was to have a small conversation with the interviewer at the last moment and I had just received news that my mother had been taken into the hospital for an operation. This was just as the interviewer invited me in. Before I went in, I double checked to see if I needed to be there. I didn’t, so I carried on with the interview. Now, if I failed, I failed, I will not ever be the person who said that I didn’t deserve to fail. But one question, after I had just found out that my mother was taken in for operation. My mind went blank. The man looked at me and kindly said that I failed the interview and that it is best that I try again in a few months. This has left me all but incredibly frustrated. I know I can and will succeed. But I’m left here wondering, do I NEED a CELTA course? I want to teach English for a career choice, I’m sure. But surely, in the past there are people still teaching without having to have a CELTA behind them to push them to new heights, no? Do schools not look at experience at all? Part of me is telling me to ignore the CELTA course for now, take the online course and finish it in my own time and then proceed to work overseas and gain the experience I need to flesh out my resume. Then, if I feel like I NEED a CELTA, I can surely go and take it then if I want to make more of it, no? I’m mainly looking to teach in Asia. I’d like to hear your opinions on this if possible. I think a fuller discussion, more viewpoints and advice can be found in the comments threads on the ELTjam page which sparked my post, http://wp.me/p3mJye-1mp, and their follow up http://wp.me/p3mJye-1oH. Let me comment on a few points. 1. Do people fail TESOL certificate courses? I suspect that very few if any people fail on most certificate courses. (The same is true, of course, for MA TESOL courses.) However, people do fail or withdraw from CELTA courses. The number is fairly low (5%? ), partly because CELTA courses turn away obviously unsuitable applicants and the pass standard is not extremely high. 2. Do people learn much from CELTA and other certificate courses? Based on my involvement with the CELTA program, I feel that most people who take a CELTA course learn a great deal from it. They learn how to manage classes, how to use a range of basic techniques, and how to use a variety of materials and activity types. They also learn quite a bit about English grammar, lexis and pronunciation and – more importantly – how to find out more about these areas. 3. Do most people learn a lot from teaching? My experience is that most people who teach English without pre-service training learn remarkably little from their teaching. (A few learn a lot, though.) This isn’t surprising since untrained teachers tend to work in the worst schools, where they teach too many hours, have access to few materials, receive little guidance or support etc. I find the situation is very different with people who teach after completing a reputable certificate course. They spend their first months in the classroom honing the basic skills and adding to the language knowledge that they learned during training. After this they are able to start turning their focus away from themselves and their teaching and to begin placing it where it should be – on the students and what they are doing/learning. Thanks for commenting. I think you’re right, both that people learn a lot and that the pass standard is not high. I can’t comment on how many people they turn away and for what reasons but would love to know more about the selection process. I still think that in the right school, with the right support an unqualified teacher can learn a lot. Or from in-house TEFL courses and some reading of their own. Rubbish schools – to me – is more of what’s wrong with ELT than unqualified teachers and it is them that need to be sweating under a glaring spotlight! 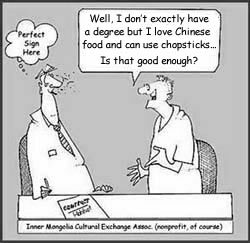 Applicants are frequently rejected because they have poor language knowledge/awareness or poor language skills. In such cases, the center often/usually tells the person to apply again after doing some study of e.g., English grammar.Many of these people do this, are accepted and do just fine on a CELTA. Some applicants are rejected because the interviewer feels they do not have the necessary interpersonal skills. I myself have rejected applicants because they were so shy they could not make eye contact or raise their voice above a whisper during their interview. I absolutely agree about teachers being able to learn a lot in the right school and with the right support. However, most schools that employ untrained teachers seem to be “rubbish schools”. (Remember Groucho Marx’s joke about not wanting to be a member of any club that would accept him? Untrained people thinking of teaching ESOL should bear this in mind.) So the teachers who need the most support end up in the schools that offer the least and where the teachers often have to deal with other terrible conditions, such as huge classes. BTW, I’m not suggesting that untrained teachers are somehow deficient if they don’t learn a lot from their teaching experience. One problem is that they have nothing to base their teaching on except memories of how they were taught. Unfortunately, most of their studies were probably in knowledge-based courses, where teaching is typically a matter of lecture, reading and writing. This does not prepare them for teaching a largely skills-based subject, such as a language. Even people who studied languages in school/college may not have a useful model to work from since so much foreign language teaching in schools/colleges is pretty poor. ya i am agree all this we need in school perfect teacher and for perfect we need to work on their field and subjects. Where the took all the opportunity and gave to their students. I appreciate your honesty and none dogmatic views. I see so many people whom I often call “CELTA Snobs” making so many comments about you’re not this or that without a CELTA or in-class training which is like 6 hours or so. Or online training is useless. In-class or online doesn’t matter information is information. It’s true that experience outweighs any certificate or degree. Most employers in Asia see it that way too. If you’re going to end up teaching children then all that grammar focus that you may do in a CELTA or some other TEFL course is not very useful. Being able to blast out a bunch of meaningless grammatical facts is pointless. You need to be able to teach people how to use the language, what to do in the classroom and how to deal with people. I took an in-class TESOL course that I thought was pretty useless for preparing me to teach in Asia. There was too much theory and not enough practicality. Later on I developed resources and courses I wish I had when I started. Thanks! I learned most of what I think helped me teach properly in my second year teaching, in Thailand, mostly teaching kids. My TEFL got me the job, but it didn’t help me do it! Same for me. My first year was a lot of stress. Happy that is past. Did they really teach you those things (#1 and 2) in your course? That’s kinda slippery or shadey or something. IDK just the lies. Absolutely we were advised not to admit how short the course was or how long we’d been teaching if it was our first job, or first year. I think, to be fair to the people advising, it was more because they felt that the course was perfectly adequate and that students just wouldn’t understand that we had been well prepared even though it wasn’t a three or four year teaching degree. They were probably not exactly meaning that this was some huge lie and we had no clue what we were doing. Even though, in actual fact, a first year teacher isn’t anywhere near as good as a teacher after a couple of years. Though that teacher partly makes up for it with spending a lot more time on prep and being very conscientious and uncynical about the whole thing! You mean admit to your students? Right must be. Not your employer. You mean the first year teacher spends a lot more time on prep? That was the case for me in my first and second job. I remember my employer used to ask me to come to my job early maybe an hour or so to plan. I think they were pretty crappy plans using pretty crappy materials that I hardly followed in the classroom. Probably cause they weren’t really readable and didn’t make much sense. The second year was similar in that I would spend a lot of time, but the owner of that school offered a bit better training and also required me to show up early to plan – unpaid which is pretty normal in Taiwan. By then I was a little better. But yeah funny. I had this friend who had been teaching for years there and he said he would hardly plan for classes. And things seemed to go fine for him. I was so envious… In all honesty that became my goal too. That seemed like the highest goal, ahhh, just show up and make it happen, lol. Then around my third year that become more or less a reality. Most of the time I would just check the book, depending on the class and prep came pretty close to none. I remember the manager at that school would complain that I would show up 10-15 minutes before classes started. IDK I certainly had classes that could have used more prep, but overall my classes by then were way better than my first year. Sometimes if you are teaching 5-6 classes or more in a row it just doesn’t seem practical. That’s just my take on it anyways. This entry was posted on November 20, 2014 by Nicola in ELT, Teaching English and tagged EFL, ELT, ESL, online TEFL courses, TEFL qualified teachers.